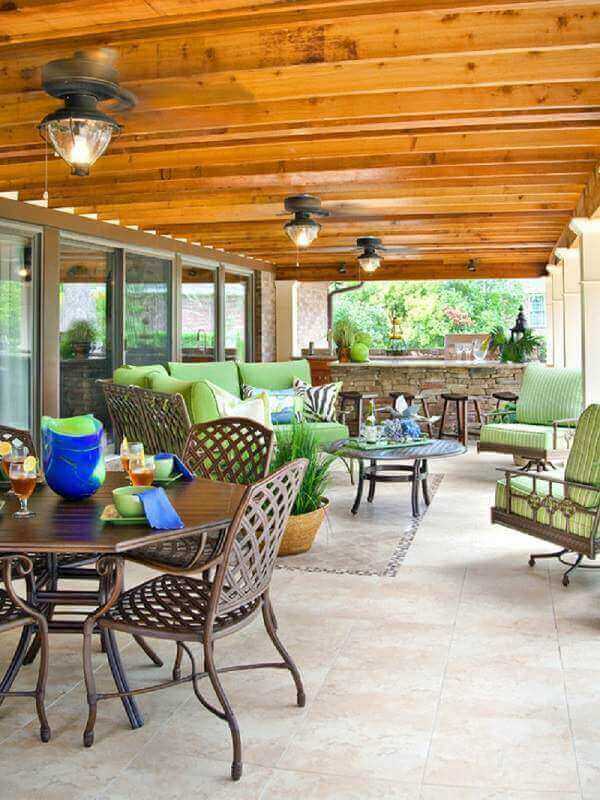 A patio is always an exhilarating spot that you can add to your home improvement plan. 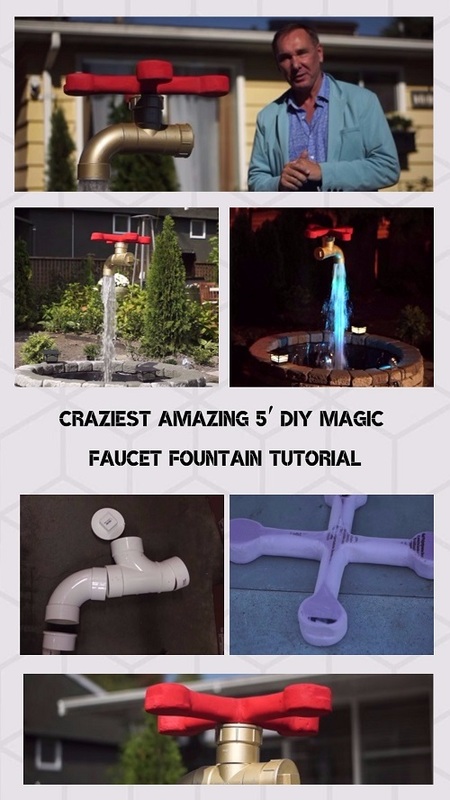 It’s a fun joyful spot which will make your beloved home feel way more exhilarating. Basically, building a patio is about adding some kind of materials to make your outdoor living space become more enjoyable. 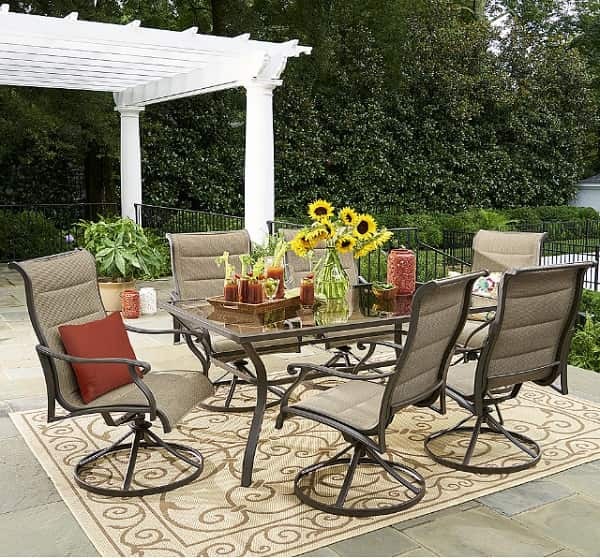 It’s about creating the proper stability so you can place some outdoor furniture to provide the comfortable seating area. There are various materials that you can use as the foundation for a patio like concrete, sand, gravel or even wood. They have their own plus and minus point that may or may not suit your needs. If you have a limited budget yet still want to have a patio in your backyard, gravel can be one of the best options to try. This kind of material will not cost you a lot yet still very suitable to build a nice patio. Moreover, gravel can also become a good choice to combine with other kinds of materials. For instance, it can be a good complement to the concrete or wood patio which will enhance its beauty and comfort. Here, we have picked some inspiring gravel patio ideas that you can use as the reference when you are going to choose that material to improve your outdoor space. They look so mesmerizing which make them worth to become the ultimate inspiration. So, let’s just keep scrolling to check out our best gravel patio ideas! 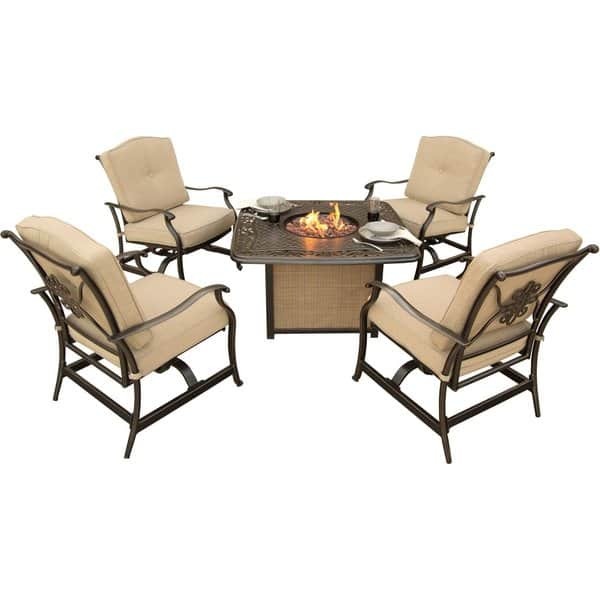 The cozy gravel patio which is only decorated by 3-piece conversation set which is made of metal. 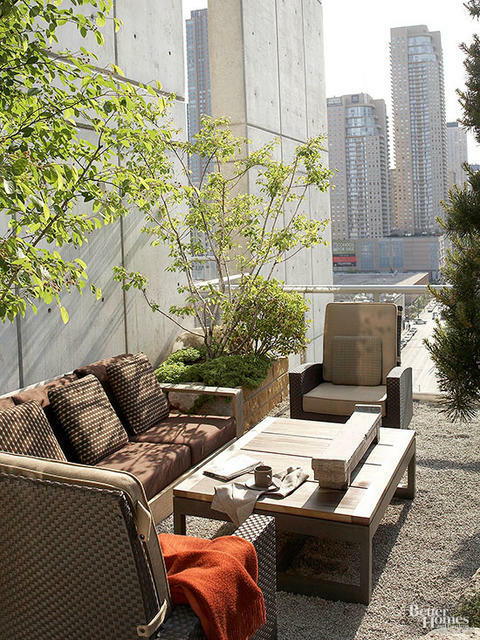 It’s a nice inspiration for you who have a small space and wants to have a minimalist patio. 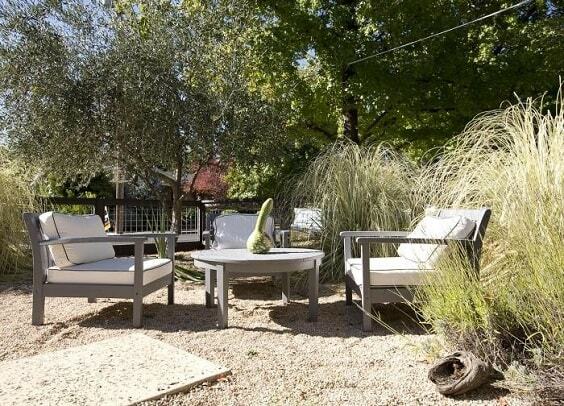 As the natural material, gravel will create such a nice harmonious look when it comes to improving your outdoor space. This one is a quite spacious gravel patio with the square shape which is placed next to the grass area, creating an inviting oasis beautifully. 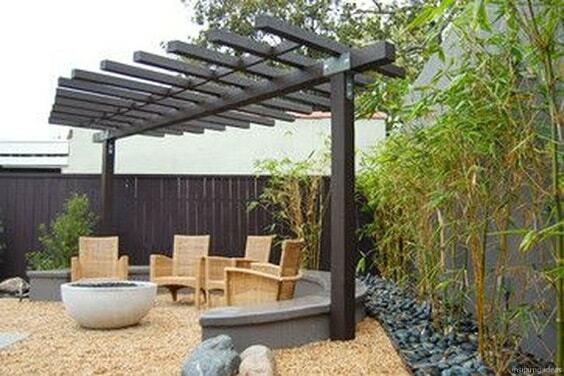 To complete the patio, a creative DIY pergola is installed that you can try to make at home easily. Inspired by the beauty of Japan scenery, this gravel patio looks and feels so inviting with its unique benches. 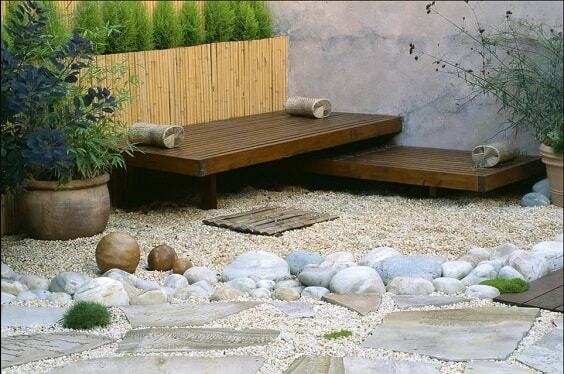 The combination of white gravels and bamboo in this idea is so inspiring to copy. 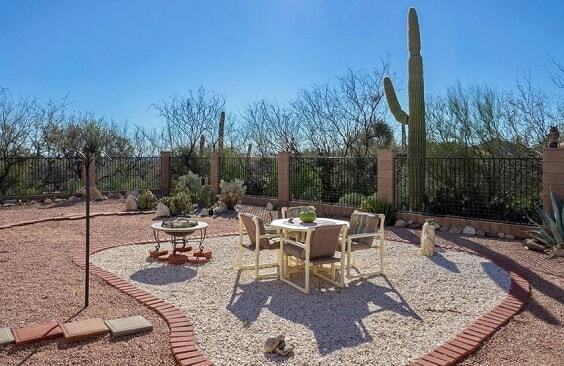 The calming-look of this patio is the result of its off-white gravels and rustic dining set. 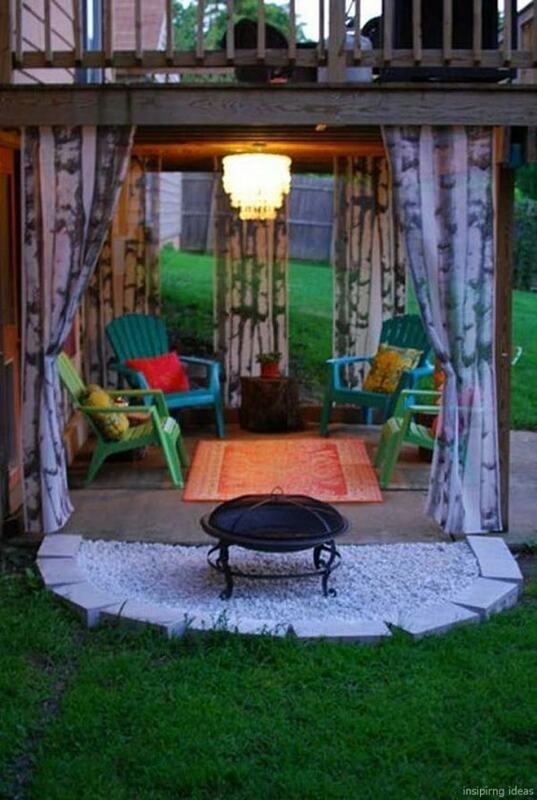 It’s such an inspiring idea to neutralize the hue of your outdoor living space in a very admirable way. 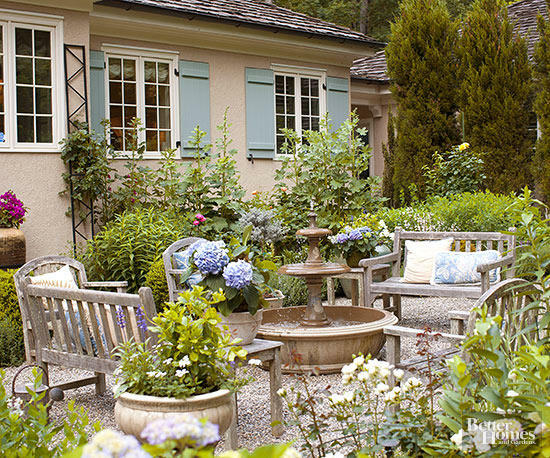 At the first glance, you can feel the comforting atmosphere from this adorable gravel patio. The base is simply made of gravel which is laid close to the brick fence. 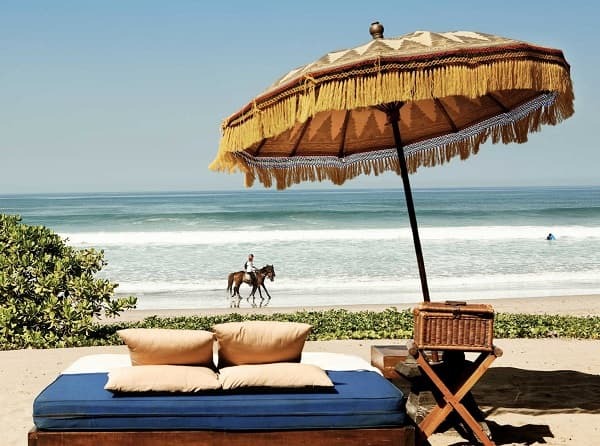 Then, all of the sitting areas come with the shade which will remain you of those classic Mediterranean layouts. 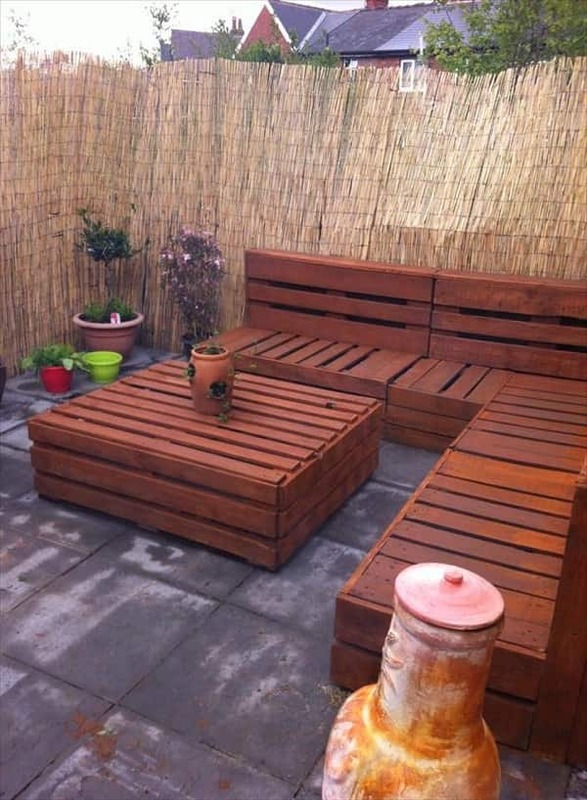 As one of the most popular backyard fence, cedar wood is always the good option to provide great security and privacy. 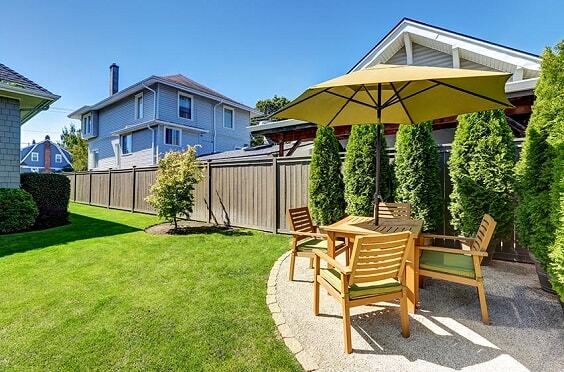 Here, the combination of a cedar fence, gravel patio, and wicker furniture create a gorgeous oasis in a green backyard. 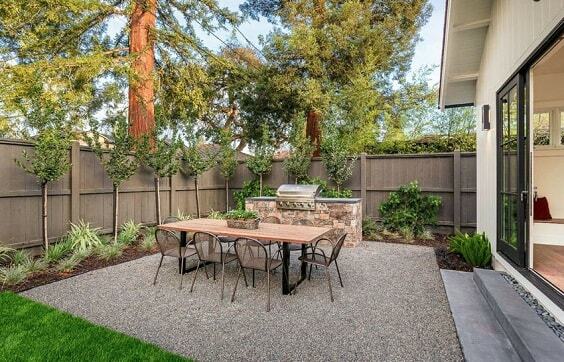 If you want to add a more modern touch to your backyard, grey will do its job well to give you such look. 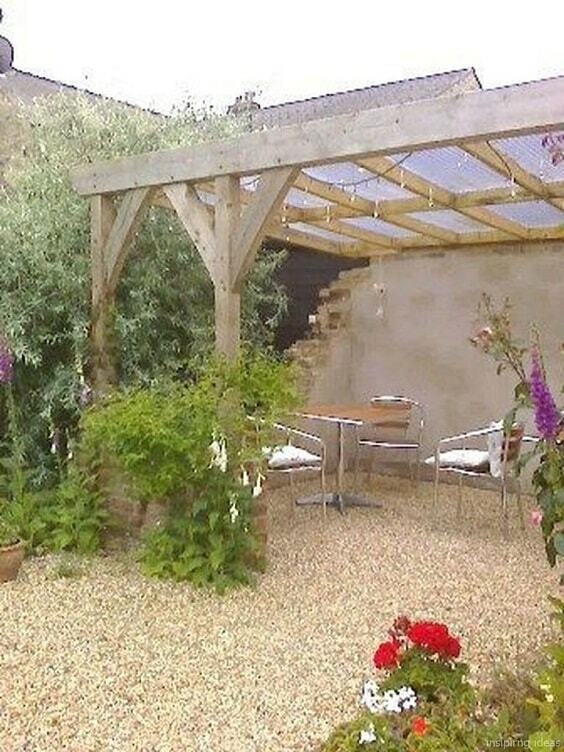 This idea shows a beige gravel patio with the grey minimalist pergola which is so tempting to steal. 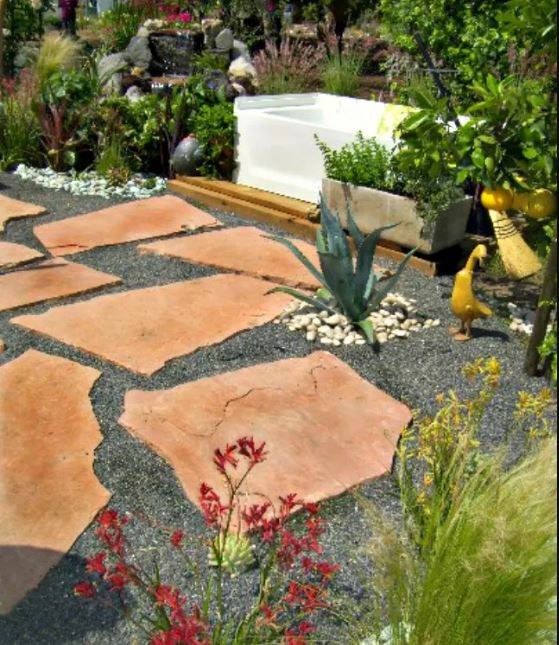 The unique gravel patio which will make your outdoor space look way more attractive. It has a nice combination of brown flagstone (in random shape) and pea gravel with the water garden as its gorgeous decoration. The beautiful circular patio with pea gravel base for you who want a much simpler patio. It’s surrounded by the rocky border which makes it look more decorative. Moreover. 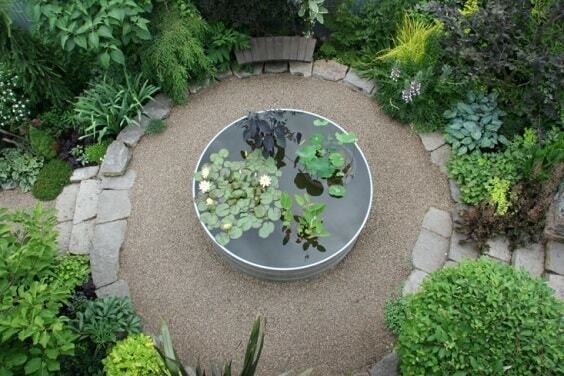 a stock tank pool pond on the center of the patio is surely made as the focal point of the layout. Another mesmerizing gravel patio inspiration to give a superb rustic touch to your outdoor living space. The weathered vintage outdoor furniture and feature perfectly decorate this grey patio which makes it look distinctively gorgeous. 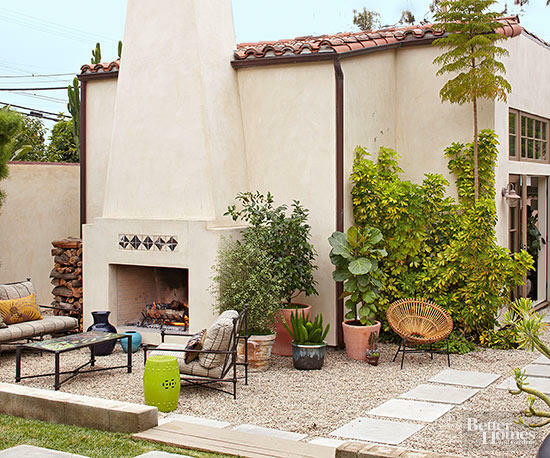 An area rug can be a good option to decorate a gravel patio. It will give a more comfortable feel and beautiful look that you can try easily. In this idea, a decorative rug in a neutral look beautifully complements all the elements of the layout. 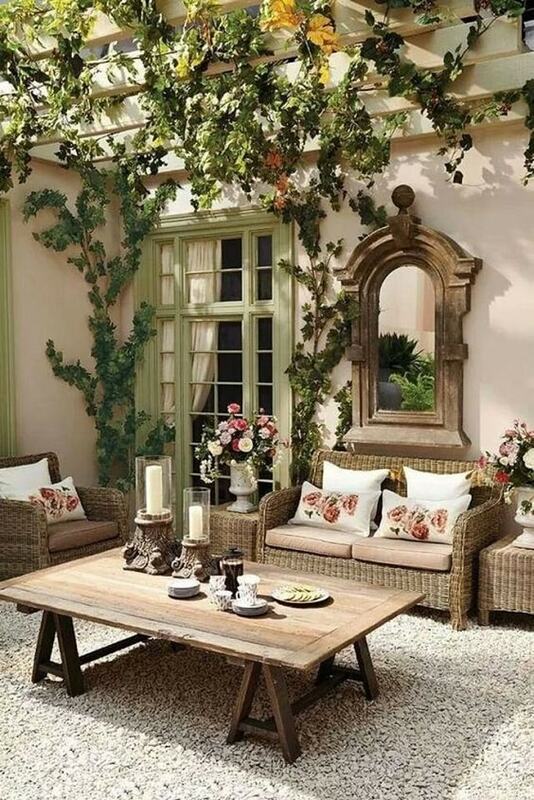 Decorating a patio with the natural stuff is never a bad idea to make it feel more comfortable to enjoy. 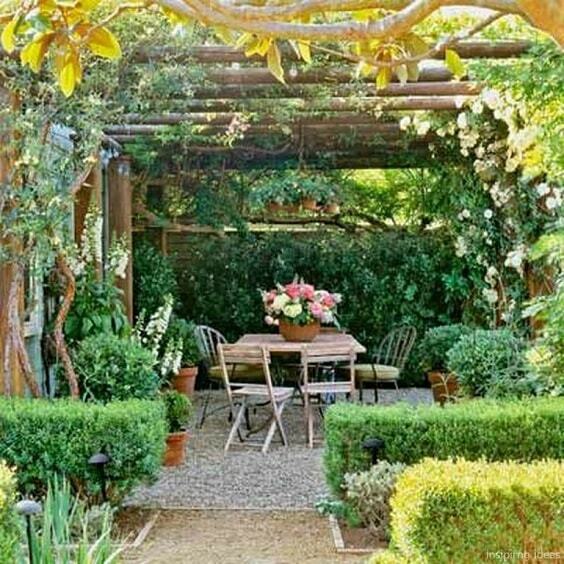 You can try to build a wood pergola with the climbing plants to complete it. 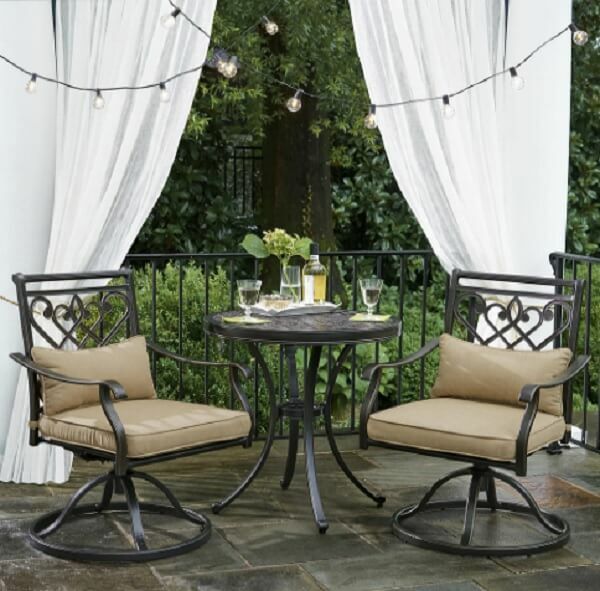 It will surely provide a cozy shade for your patio without costing you a lot. Building a patio with its extended walkway is surely a good consideration, and you can use gravel to build both of them. This one is a patio with flagstone and gravel base with the built-in walkway which is also made of the same type of gravel. Do you love the adventurous vibe of a swamp? 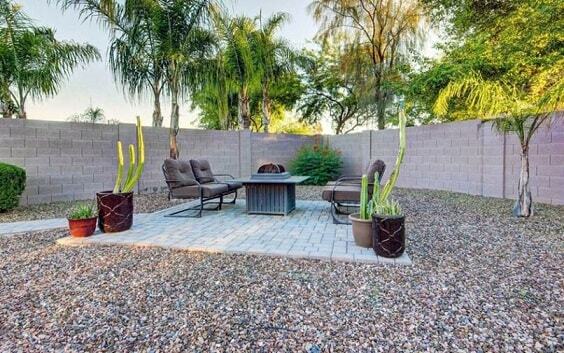 Well, using the weed as the border of your patio can be a considerable idea to try. This gravel patio is surrounded by weed which actually works well as the natural privacy and security. 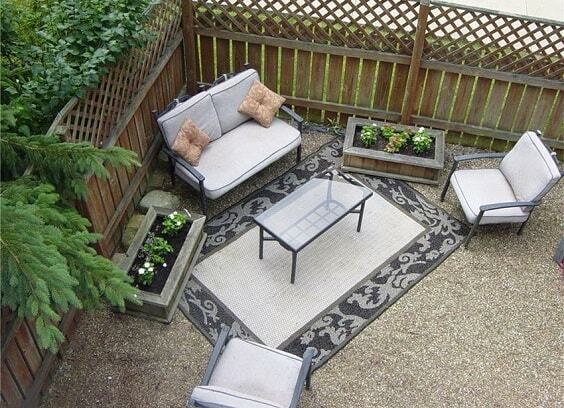 The adorable spacious patio which is dominated by the loose gravel. Then, the sitting area is made of the paving stone which is decorated by some chic greeneries. Arranging the flagstone in a random arrangement can one of the simplest way to create a unique gravel patio. 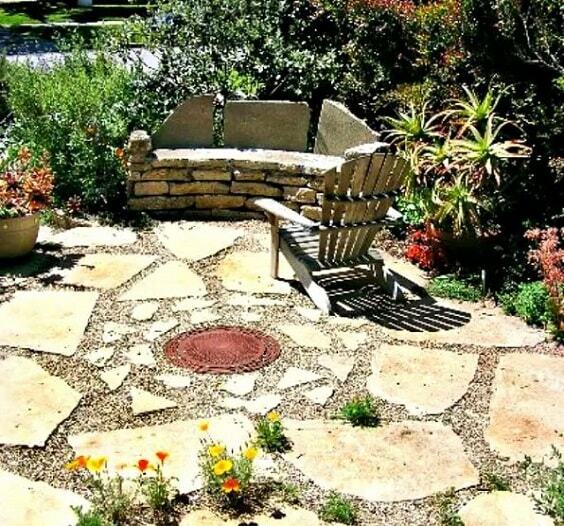 This one is a circular patio with the flagstone accent which is made in random shapes and sizes. Crushed gravel gives a softer feel when you step on which will create a super comfortable patio base. 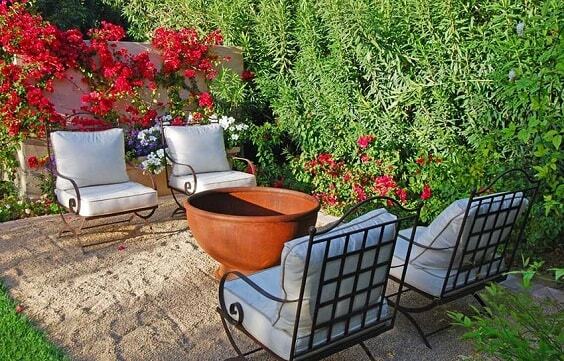 Here, the sand-like gravel is decorated with the classic chairs and a fire bowl which look simply stylish. Then, the flowers and greeneries beautifully colorize the are which also pops up the inviting vibe very well. 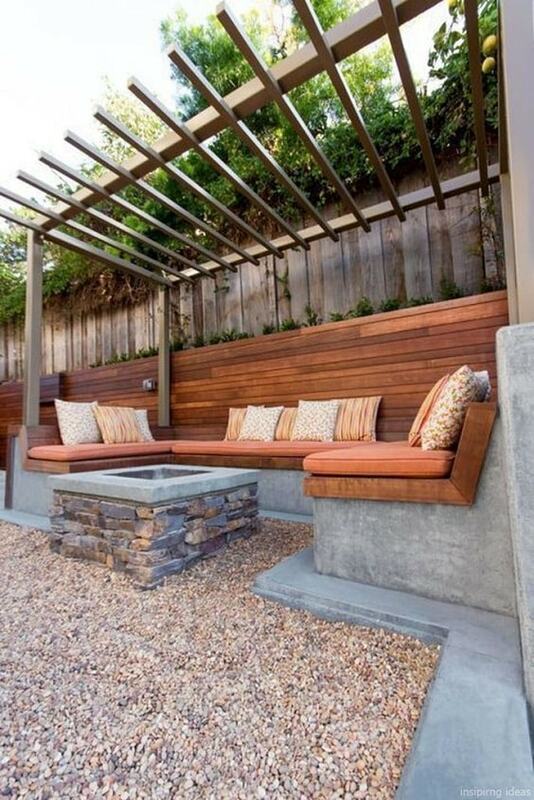 Rather than buying some outdoor furniture, you can build a cozy seating area from some durable materials like concrete. 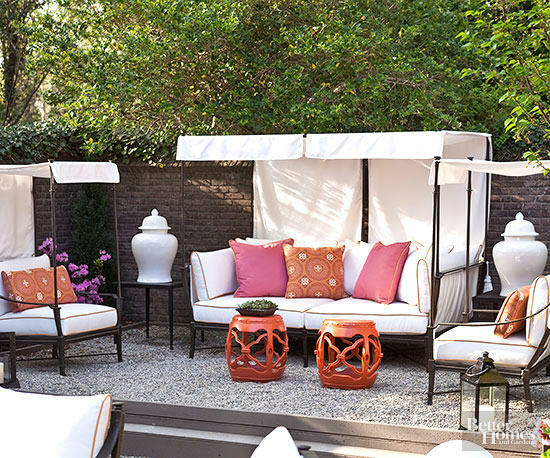 Tthe U-shaped bench with the cushion is built on this travel patio which looks so comfortable to enjoy. Another simple patio with the crushed gravel base and this one is completed with the 3-piece conversation set. 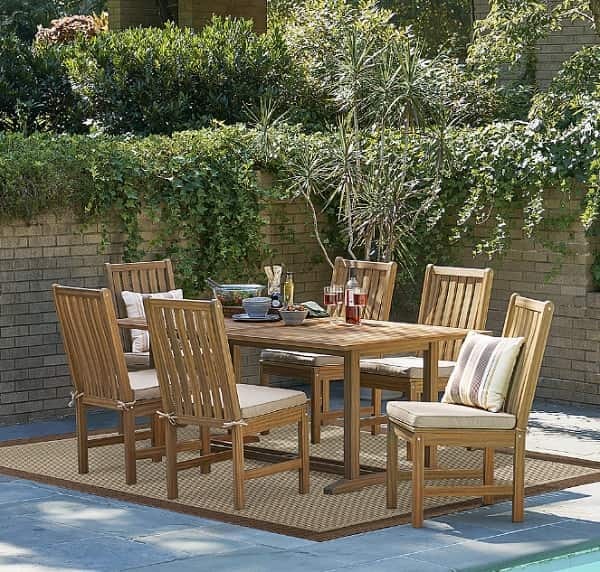 The bench-style seating and the simple rectangular table create such a fun picnic vibe which makes the patio become so enjoyable. 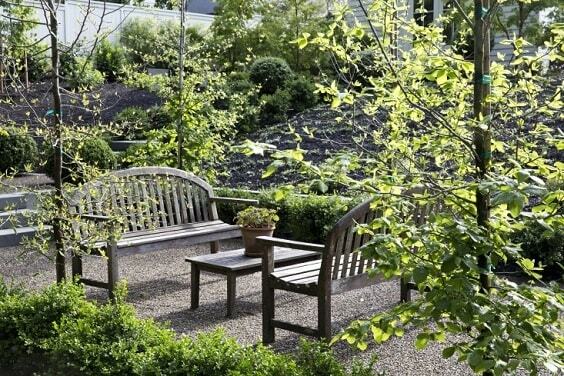 Furthermore, the shrub and trees around the patio enhance its beauty and comfort very well at the same time. The beautiful wide patio with the natural sandy hue to add to your ultimate references. All the elements of this patio create a nice harmonious look in a very smart way. This gorgeous patio shows a chic combination of modern and earthy style in one layout which is worth to copy. It’s basically a pea gravel patio with the wicker furniture, but its high concrete fence makes it look more distinctive. The contrasting look of the grass field and concrete patio in this outdoor space is so mesmerizing. 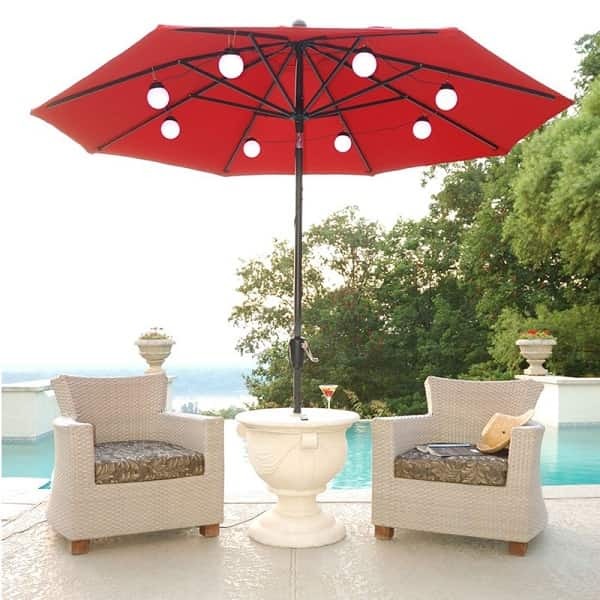 It has a 5-piece bistro set with an outdoor umbrella which is enough to make it so enjoyable. In addition, it can be a good option for you who have a narrow space since the patio is built in the corner of the space. 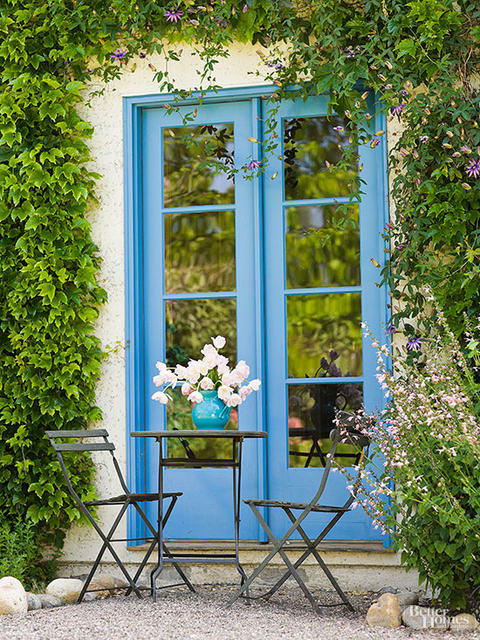 One of the timeless decoration styles that you can always choose to decorate a patio is shabby chic. Here, the rustic table, mirror, vintage floral pillows and wicker chairs give a shabby chic nuance beautifully. Then, the climbing plantation completes the look to add a more refreshing atmosphere. The Adirondack chairs can be the good option to use when you want to have a patio which looks beautifully classic. 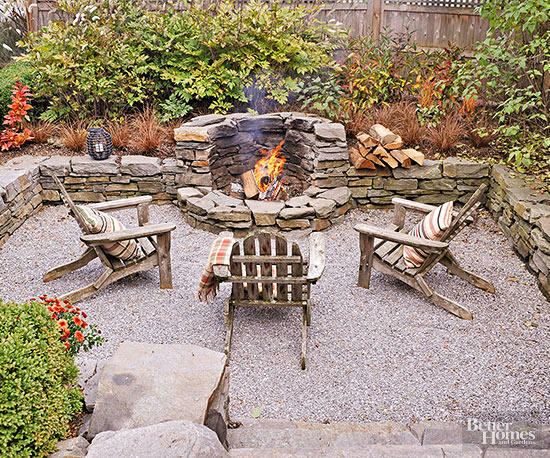 Such chairs decorate a gravel patio with the flagstone border which creates a rustic atmosphere gorgeously. The unique gravel patio with the mosaic slate tile on its center for a focal point sitting area. 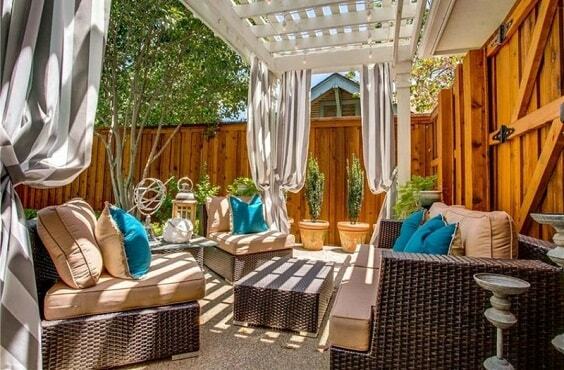 It can be a great inspiration for you who have a spacious patio. This one is a patio with the combination of wood and gravel base. The wood section works as the foundation of a seating area and the gravel one handles a small barbecue grill. 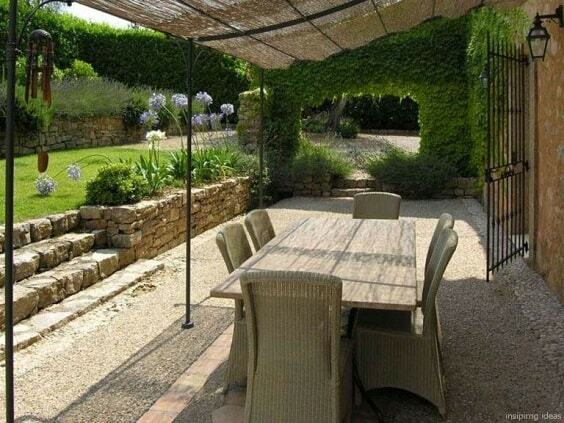 The inspiring gravel patio which will not cost you a lot due to its cheap material choices. It uses brick as the border to separate the are from the other section of the garden. 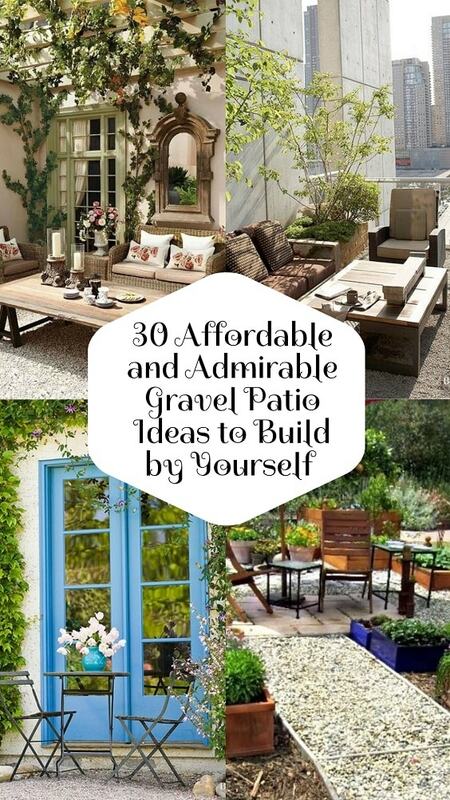 So those are some inspiring patio gravel ideas which look so tempting to try. 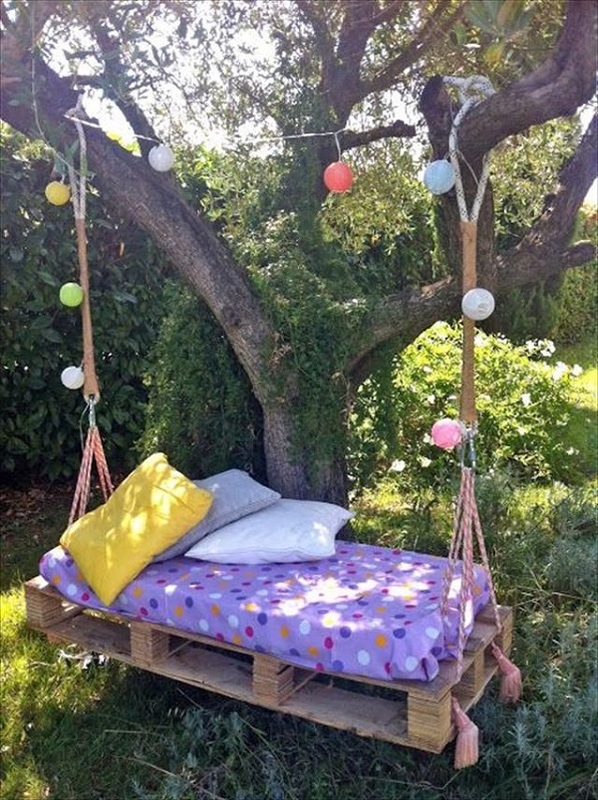 They look so adorable and feel so comfortable to give your outdoor space some improvements. 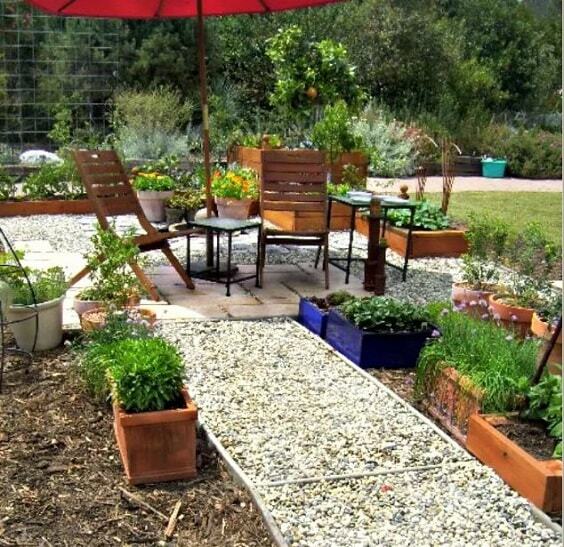 It’s always a good thought to choose gravel as the material for a patio base. It’s an inexpensive and easy-to-maintain material that you can always consider to pick. Commonly, there are three types of gravel which are used to build a base of the patio which are pea gravel, crushed gravel, and loose gravel. Each of the material has its plus and minus point which may or may not suit your needs. Furthermore, gravel is also a friendly material to combine with other stuff. 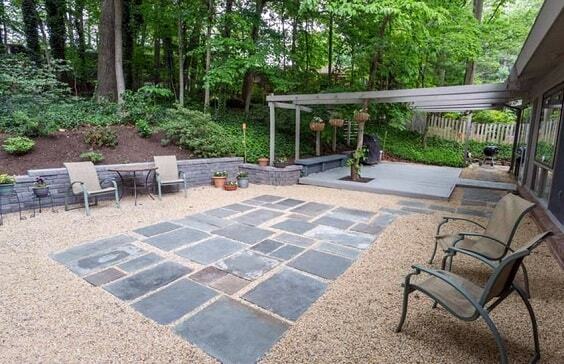 Many home experts suggest using paver, slate, wood, or flagstone to enhance the beauty and comfort of a gravel patio. Lastly, you can always the outdoor furniture in many styles to decorate a gavel patio since it always looks good to create a modern or classic layout. It depends on your taste on how to style up a patio with the gravel base. Well, happy building your very own gravel patio now!